Carol E. Wyer is an award winning author whose humorous novels take a light-hearted look at getting older and encourage others to age disgracefully. Her best-selling debut novel 'Mini Skirts and Laughter Lines' won five awards including Readers Views Reviewers Choice 2012 Award (category - humour) and was selected as a finalist for both the Next Generation Indie Book Awards and the Indie Excellence Awards 2012. 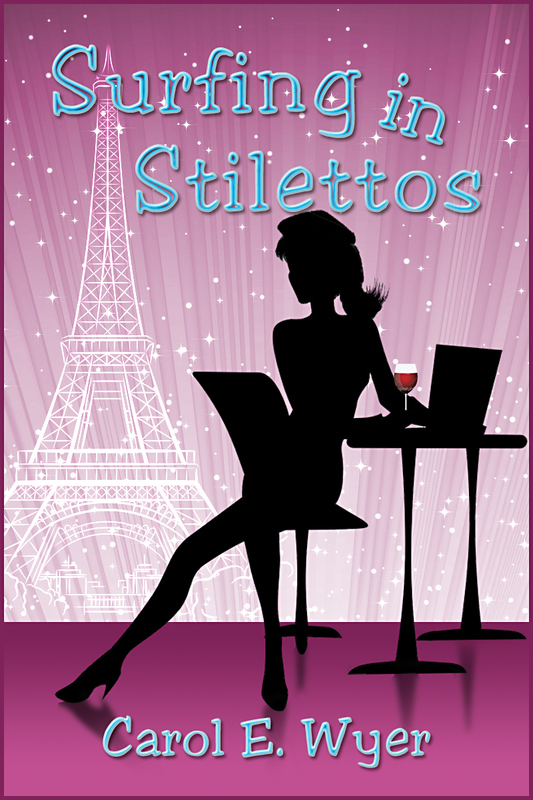 'Surfing in Stilettos' which follows the further adventures of Amanda Wilson as she attempts to inject some fun into her life, is a Costa Award nominee. Carol recently signed a two book deal with ThornBerry Publishing. She is a fellow featured author at loveahappyending.com. Janice, thank you very much indeed for letting me monopolise your blog today. I am sorry that I had to bring Hubby along, but as you can see, he has made a valiant effort and worn a tartan kilt, although I’m not sure which clan that is supposed to represent. I’ll just sit him down with a copy of the FT and an iPod to keep him occupied. My mother and father shared a good sense of humour and were always up to mischief. My mother is still getting up to it, even though she is almost eighty now. She, like Amanda’s mother in my novels, is partying her twilight years away in Cyprus, although I don’t think she has tried pole dancing. Well, not to my knowledge. I love the sound of laughter and I truly believe that laughter is a medicine. I lived next door to someone who taught laughter courses. I attended one once. We had to laugh at each other. It was lunacy, or so I thought; but before long we were convulsed with laughter at the stupidity of what we were doing. Believe it or not, even if you have to force yourself to laugh to start with, you will genuinely end up laughing properly. And, you’ll feel great afterwards. 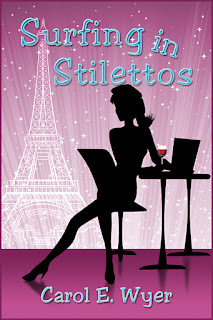 My novels always have a lot of humour in them and Surfing in Stilettos is no exception. I have three more novels planned and have started work on two of them. My master plan is eventually to be recognised as a humorous writer. I am very proud of Surfing in Stilettos. It is already nominated for some awards including a Costa so I have hopes for it. Thanks to ThornBerry Publishing it is available today from Amazon. If I might I’d like to put in a plug for my big launch party at my blog today where there are some fabulous prizes and gifts to be won, along with some secrets about the novel. Please drop by and say hello later. Thank you again Janice. I’ll drag Hubby away with me now to continue with his chauffeuring duties. He still has lots of driving to do today! And: As as a necessary part of Carol's fabulous Surfing in Stilettos Blog party today I'd like to display my own very favourite heels! And yes, those are my legs and the tattoo is real too! Oh Wow! Those shoes and that tattoo are amazing. Many, many thanks for showcasing me here today. I think you stole the show though - I have had to make Hubby a large black coffee to calm him down after seeing this! I think you might just get a few new followers ladies .... of the male persuasion! Have a fabulous party! What a wonderful, uplifting post, Carol - thanks for making me smile! All the best with your new book. I love those shoes! Shoe envy! Great post ladies! Marvelous shoes! And I love that tattoo! You're so brave... I've always had a bit of a secret crush on tattoos but my husband would kill me if I got one done! Woa fantastic set of pins there Janice and lovely shoes to boot. I am such a chicken about tattoos - did it hurt? Thanks for all the lovely comments - Carol's party has been fabulous - with prizes! I do so want to win a pair of those chocolate shoes! Please, lovely visitor peeps - do 'follow' my blog and do sign up for The Spellbindingly Fun Blog Party on Friday 26th October in celebration of the official launch of my new release 'How Do You Voodoo?'. I promise spelllbinding fun and prizes!